I met Alan Lester at an Ottawa woodworker association meeting. He was demonstrating some jointer techniques. 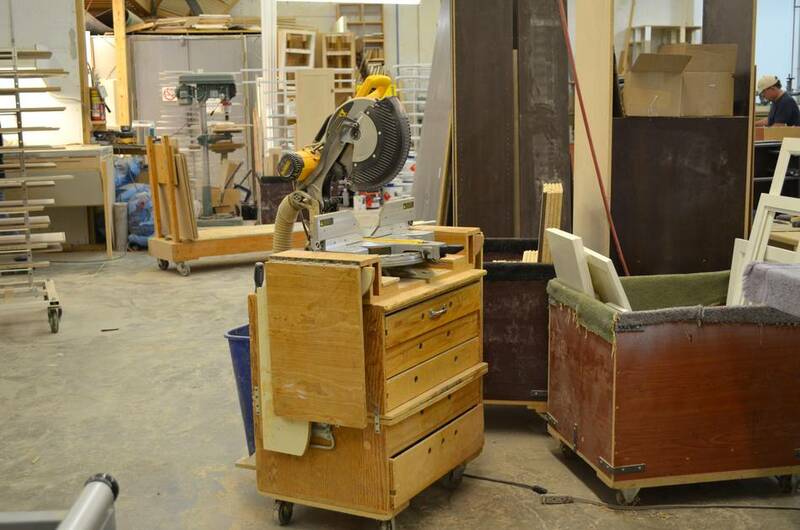 I had brought in my homemade jointer to that same meeting to show it off. The three-phase power needed for the jointer in the school's shop needed a key to turn it on, which nobody present had. So Alan ended up demonstrating using my jointer. I could tell from how he used it that he's accustomed to a more powerful machine! 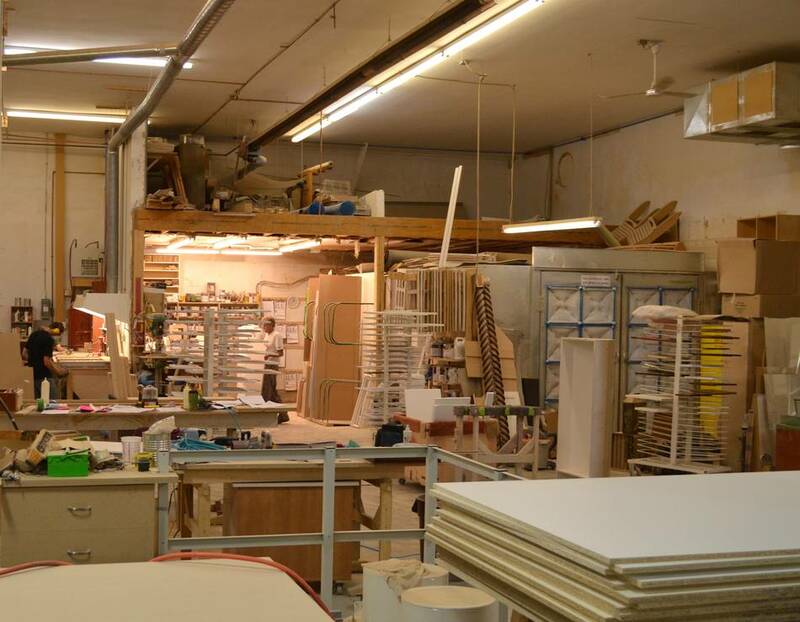 Alan Lester is co-owner of Karhu Fine Cabinetry & millwork. 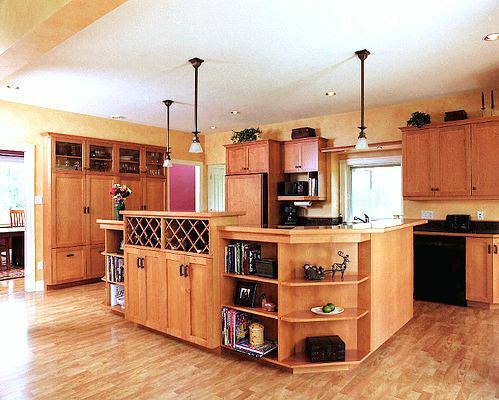 They make custom built in cabinetry and Millwork, mostly for high end homes. There's a gallery of some of their work on their website. 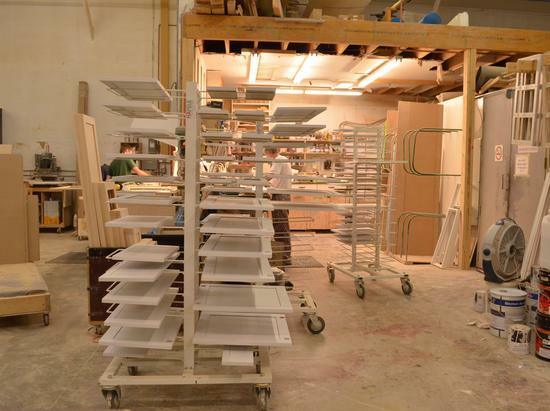 Most orders come in through designers who work on custom houses and renovations. They don't make kitchens for new subdivisions, because the builders primarily want many identical kitchens at the lowest possible price. Alan showed me around the shop. It's a busy place, with about 20 people working there. Looking along the new wing of the building. 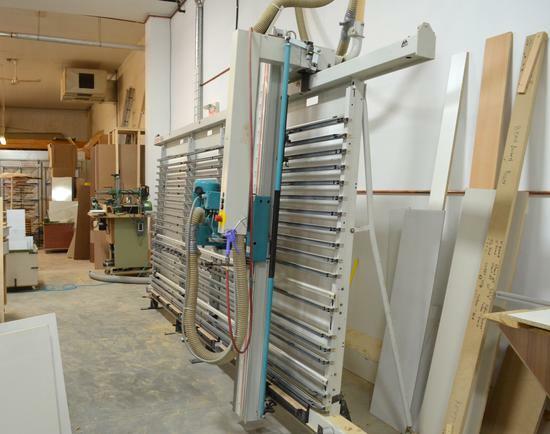 This part was only added last year (2011), and holds most of the larger machines -- machines that would be the envy of many a hobby woodworker. But it's not all fun and games. The business is about building custom cabinetry. 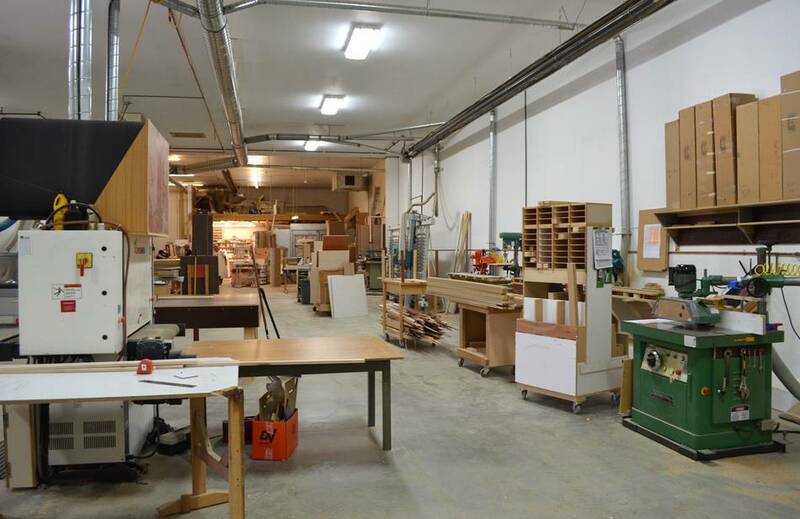 Although it's working with wood, it's very different from the sort of woodworking that magazines such as Popular Woodworking or Fine Woodworking write about. Alan says he has to be careful about hiring people who say they are "into woodworking". These people may be amazed by the equipment, but they usually aren't a good fit for production work. 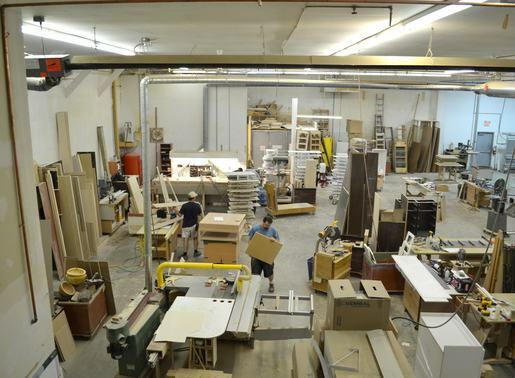 For solid woods, Alan says "We use cherry the most, but quarter cut and rift cut white oak are becoming very popular. We also use a fair amount of walnut and a bit of maple." Although wood is not cheap, they usually buy a little extra to be safe. 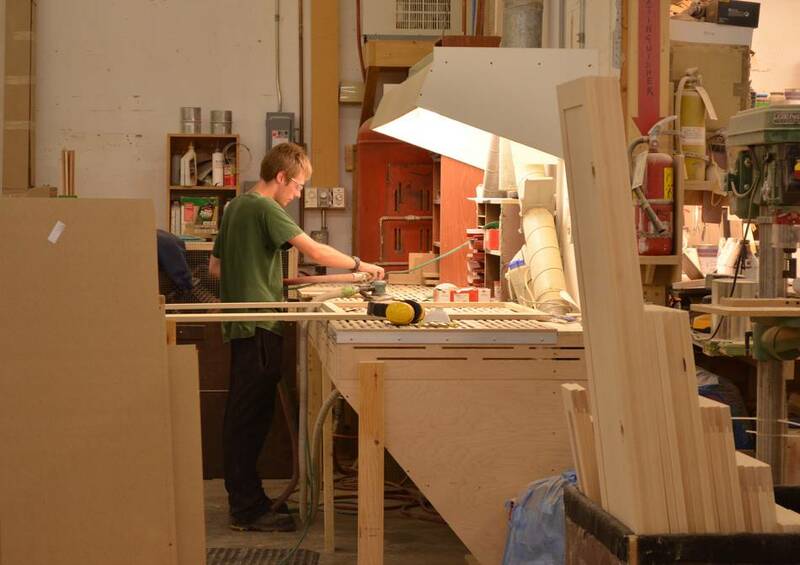 "Compared to the cost of the time and labour for making up for being short one piece, wood is cheap". 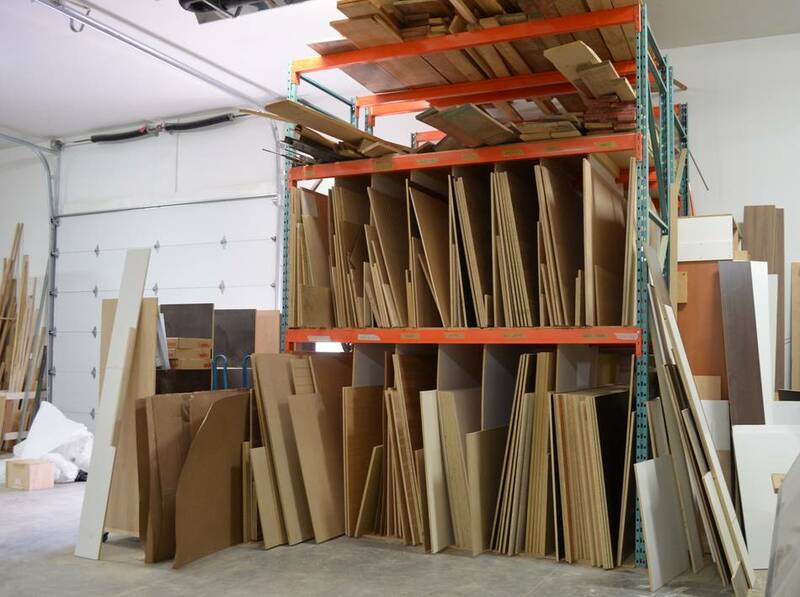 For large panels Alan prefers veneered particle board and MDF. About Baltic birch. He says that Baltic birch "often comes to us twisted. Particle board and MDF are generally flat and stay that way." I was a bit aghast at having my favourite plywood compared unfavourably to MDF. After all, I made jointer tables from it and they stayed flat. I'm happy if my one set of hand-picked and carefully treated surfaces stays flat. But if one in ten panels for a cabinet job is warped, that's unacceptable for a business. And I have to say, I was surprised at how much less balancing my bandsaw wheels from MDF needed even compared to Baltic birch. The more finely chopped and mixed the wood is, the less likely it is to warp. And an old Delta Unisaw. Alan says "Not much can go wrong with a Unisaw. That saw was already 30 years old when we bought it 30 years ago". They also have a Felder table saw. This one is not a combination machine. Alan isn't a big fan of it "not all they are cracked up to be", he says. I watched a guy make some cuts on this saw that would have been easier on a smaller saw. I asked "why don't' you just get a cheap saw for doing that sort of cut". "There's no such thing as a cheap saw" Alan responded. 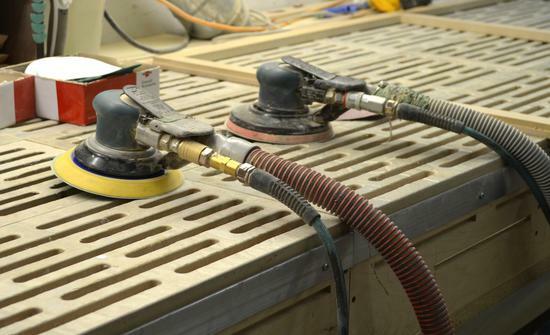 "Even a cheap machine needs floor space, needs to be wired in by an electrician, and needs to be plumbed to the dust extraction. And then how often would you use it? It's too easy to get carried away buying lots of equipment". 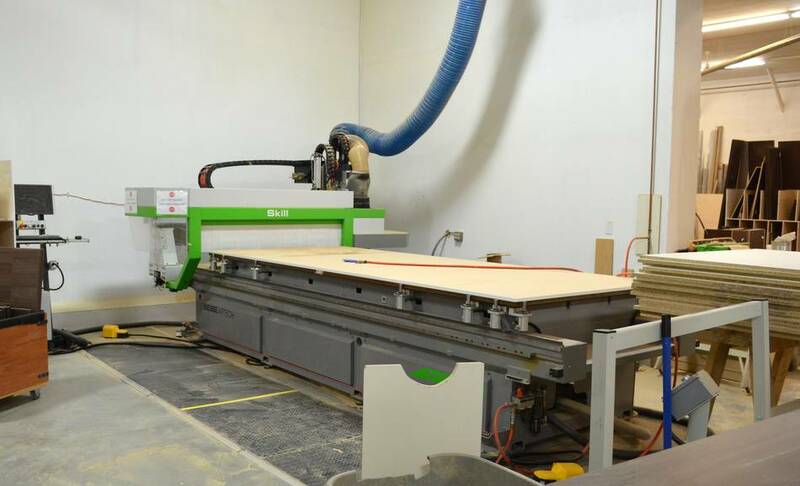 Most of the panel cutting is done with a CNC machine these days. 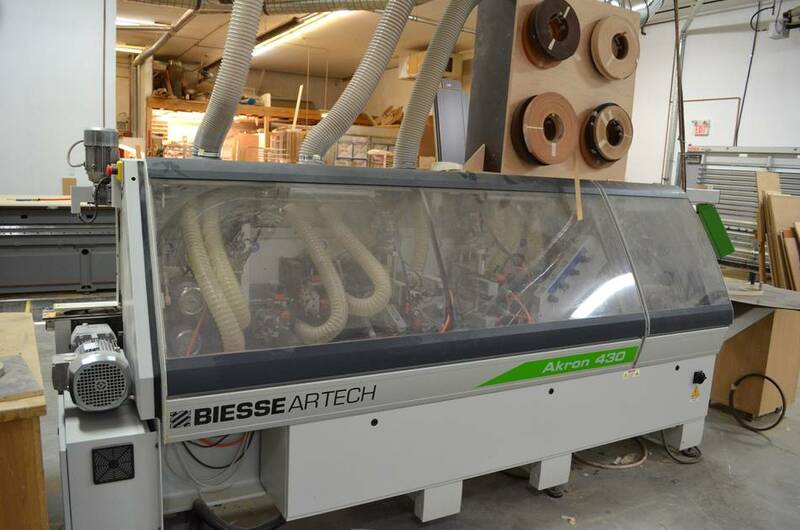 The CNC machine is from Biesse. The name "Skill" on the gantry refers to the model, no relation to skillsaws. This machine is very different from your typical hobbyist CNC machine. It's equipped with a tool change turret. Most of the cutting is done with a 1/2" (13 mm) cutter. 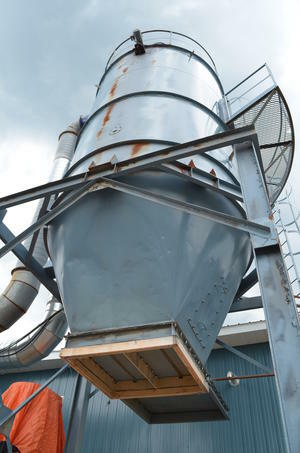 The wider cutter wastes slightly more material, but higher feed rates can be achieved. They typically cut 3/4" panels in a single pass, with the cutter spinning at 25000 RPM and a feed rate of 22 meters/minute That's 36 cm (15") of cut every second. That would be fast even for a table saw. Also visible is the "drilling block" which can drill many holes at once. These are for shelf pins and mounting European style hardware. 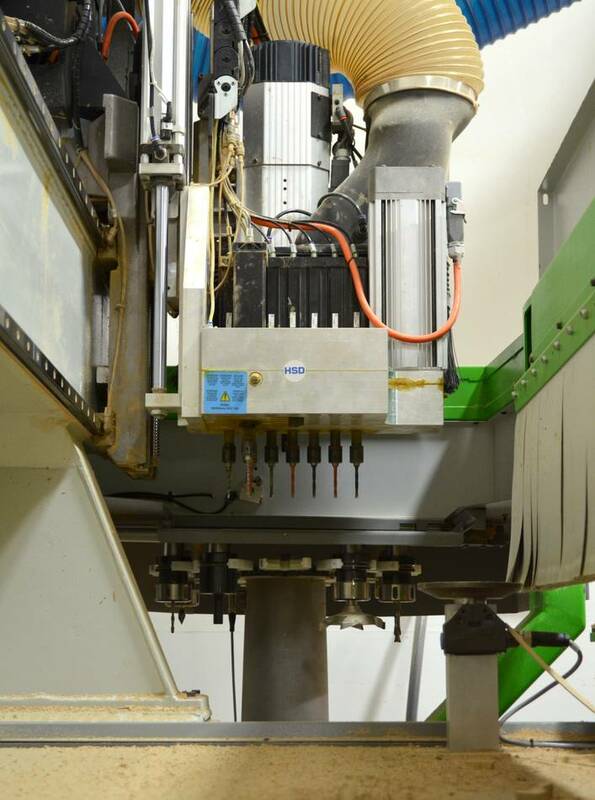 Aside from saving a lot of labour, the CNC machine also leads to greater accuracy. This is the edge bander. That's a machine few hobbyists would know what to do with, but for cabinet shops, these are essential. Except for the heavy machines, most things are on wheels. This used to be much more important before they added on to the shop. "For the more common power tools (drills, drivers, jig saws) I have tried the more expensive brands and found they don�t last any longer, or not enough to justify the cost difference. In the end it comes down to cost. I almost never pay full price for power tools. I watch the Home Depot fliers and buy when there�s a sale on. For the more expensive common tools like routers and miter saws I go to the DeWalt repair centre and buy re-built tools. Generally about 2/3 to 3/4 regular price. But... they don�t always have what you want in stock. For the oddball tools, like the Festool domino, we have no choice but to buy the expensive brand. 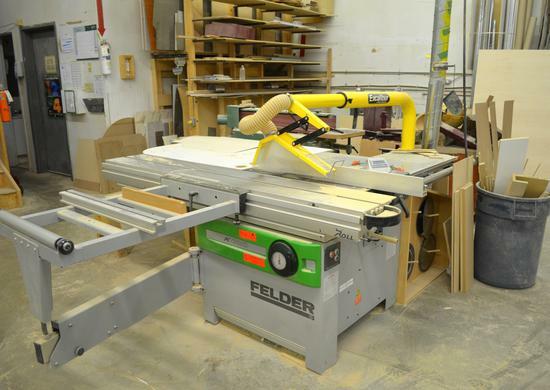 I should also mention that I buy the cheapest biscuit jointer out there, the Freud JS 100A. I�ve been buying it for 25 years. It�s not fancy, but it works well and at $125 it�s disposable. 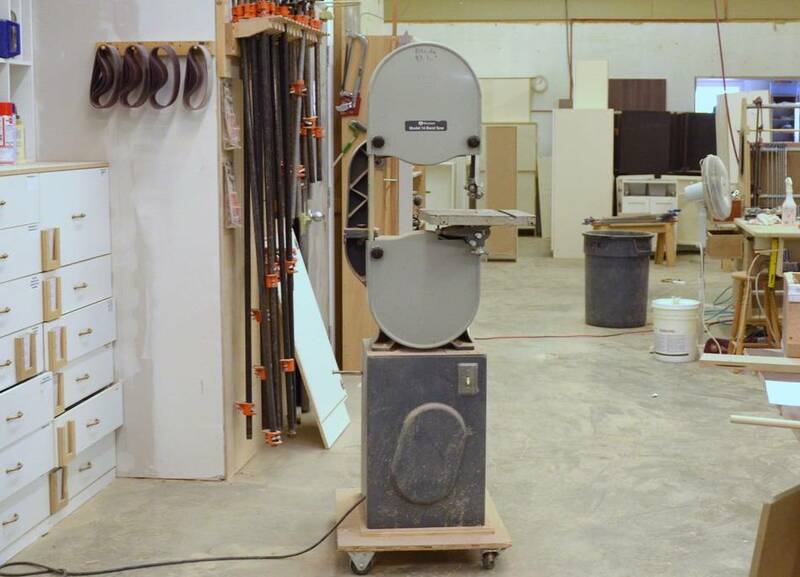 Another tool we�ve been buying for ever is the Makita 3 x 24" 9924DB belt sander. I tend to find a tool that works for us and stick to it. Then I can scavenge parts occasionally, but more importantly the guys are comfortable with them. Then there's no breaking in period as they get used to a different tool." 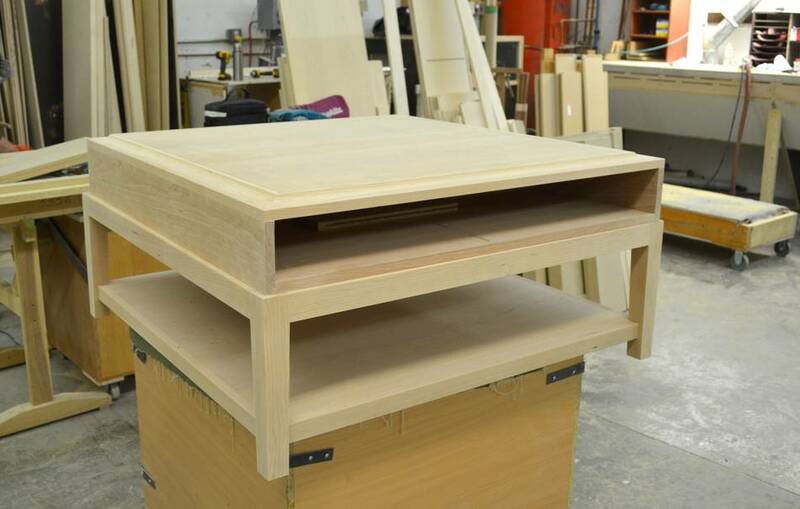 The slots in the downdraft table were a quick job on the CNC machine. They use a lot of air tools. Alan says the air tools generally last longer than their electrical equivalents, though not so much with the orbital sanders because they don't oil them like they should. The oil has a tendency to get out of the sander and onto the work. They get about a year out of these sanders before they wear out. 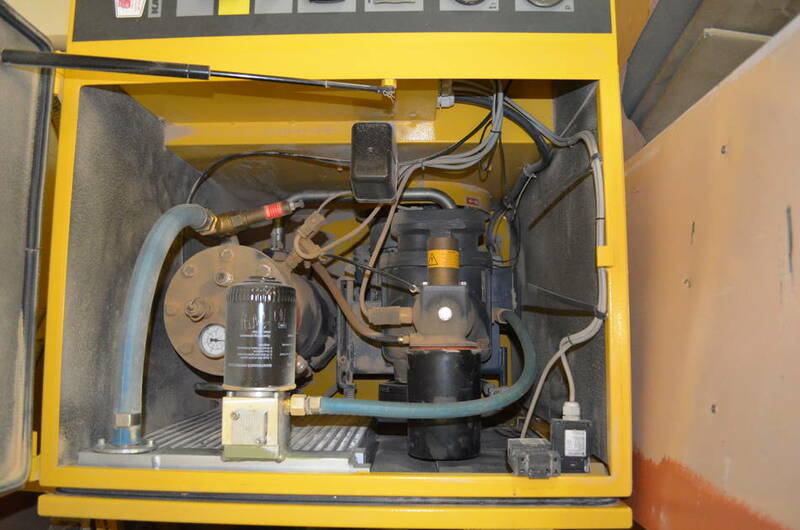 With a lot of air tools in use, there's a need for a suitable compressor. They used to run a 15-horsepower piston compressor, rated 60 CFM. But it was loud, and with multiple sanders each using 18 CFM, it wasn't always able to keep up. They upgraded to a screw compressor, which is smaller and quieter, with greater capacity. In such a large shop, there's also a need for a lot of dust extraction. They currently have a 30 HP dust extractor. The previous one, a 7 1/2 HP Oenida wasn't enough for the shop as it grew. It's for sale, contact Alan if you are interested. The painting booth (far corner in this photo) vents to the outside, pulling about 8000 CFM out of the shop. A 1,000,000 BTU make-up unit heats up replacement air. 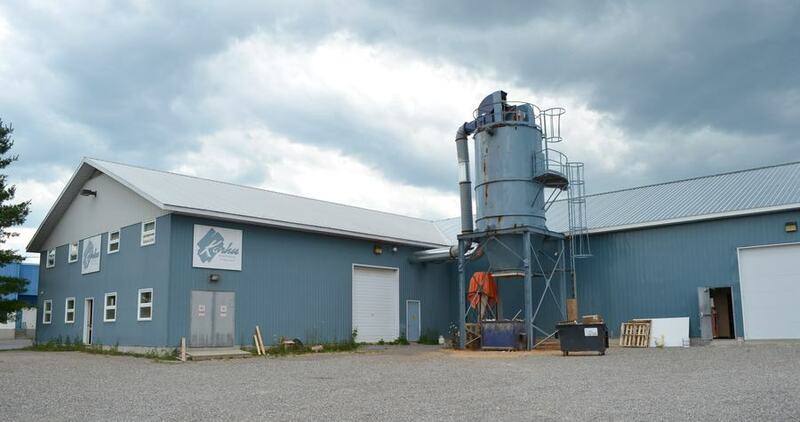 The BTU and airflow of that furnace are about ten times that of a residential furnace. This makes for over $7000 in annual heating costs. 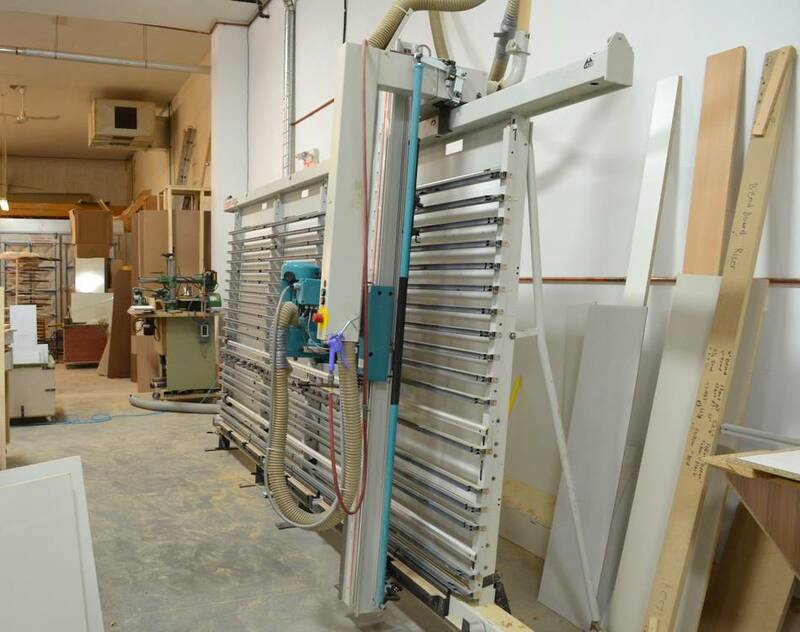 Not quite ten times that of a house, because the spray booth is not in continuous operation. I asked Alan about using a heat exchanger to recover some of the heat from the paint booth exhaust. 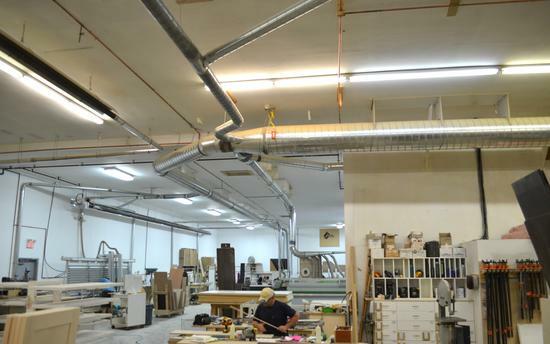 "Heat exchangers for spray room exhausts don�t exist to my knowledge". There are many rules and regulations relating to labour, safety, and the environment, and spray booths are especially difficult in this regard. Sometimes rules from different bureaucracies even conflict with each other. That all these rules might handicap a business man not concern a government inspector. But inn the mean time, there is competition from China, where wages are low and people and the environment are treated almost as expendable. 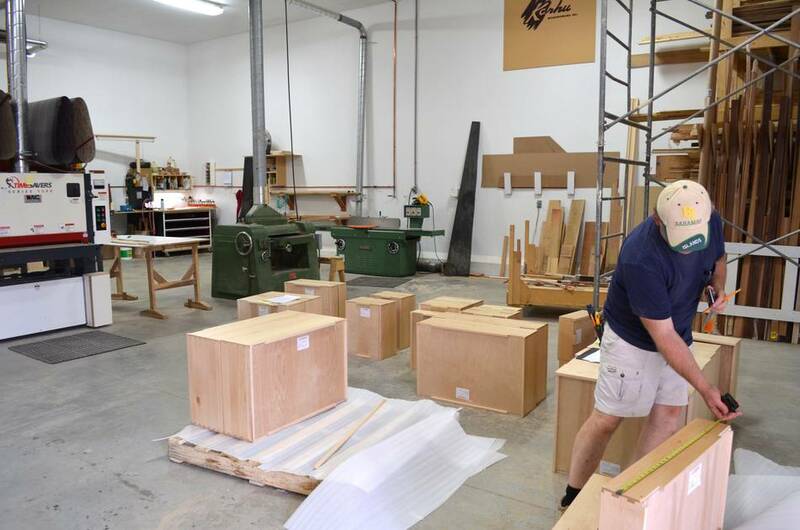 Most cabinet shops buy the doors pre-made, but it's hard to get consistent quality and good colour match that way, so Karhu builds most of their cabinet doors from scratch. The costs work out to about the same as buying pre-made doors. But not everything is made from scratch. These solid hardwood drawers were bought pre-made from a company in Quebec "For less than we can make them for" says Alan. The quality is good, with very few defects. 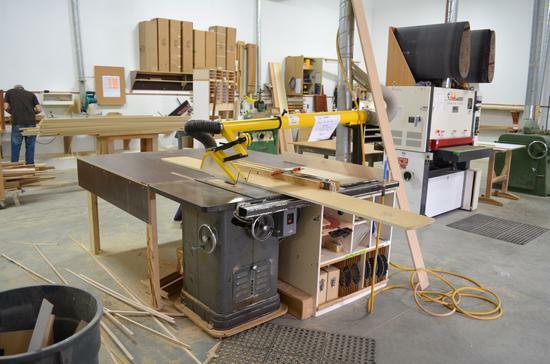 Bandsaws don't play much of a role in cabinet work. 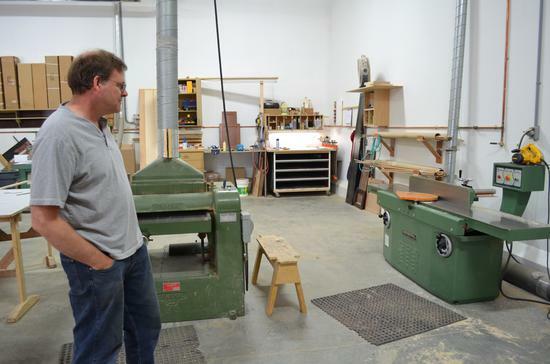 In fact, when I checked out Gregor Bruhn's shop, there wasn't even a bandsaw in the shop. Karhu only has one 14" bandsaw, "and it might not even be properly set up" says Alan. Very different from my sort of tinkering work, where the bandsaw is one of my most frequently used machines. 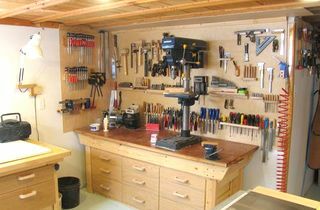 Despite all the nice equipment they have, for my type of work, I'm better off in my modest basement workshop where I have my most frequently used machines very close together. That said, they also make the occasional non-cabinet piece of furniture at Karhu, roughly two per month, if a designer they work with calls for something different. 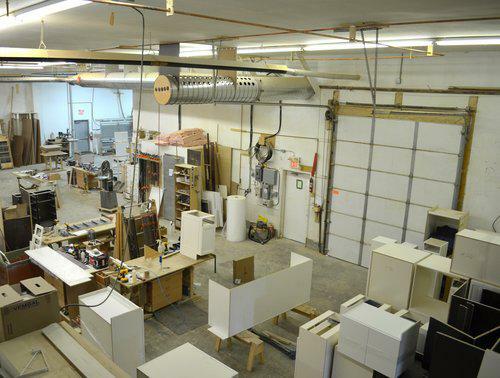 By hobbyist standards, that's still quite a lot, but it's a small volume compared to the cabinetry business. With the business the size it is, Alan mostly works on administration these days. Although, when they are short handed, he'll also work the shop floor. 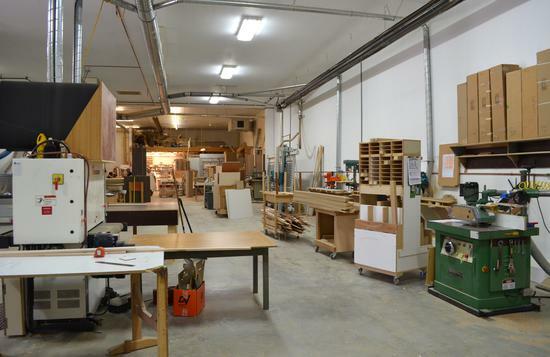 Despite doing it professionally, Alan still enjoys doing some wood turning and wood working as a hobby. 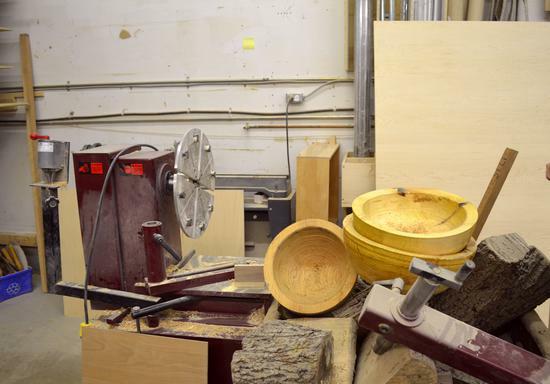 Here's his bowl turning lathe, along with some rough-turned bowls. Bowls are turned rough from green (not yet dried) wood. The bowls are then let dry. Drying causes the bowls to warp to some extent, but with the thick walls on the rough-turned bowls, they can still be turned completely round again.